Novus, the best selling gas fireplace of all time, is now better than ever with features that are customer designed and driven. 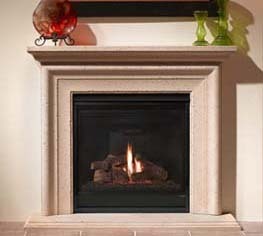 Featuring a 19-1/8" deep firebox, this base dimension makes it ideal for both corner and side wall installations. Available in front glass width dimensions of 30" (20,000/14,000 Btu/hr input), 33" (22,000/15,000 Btu/hr input), 36" (25,000/17,000 Btu/hr input), and introducing the 42" (30,000/20,500 Btu/hr input). Novus direct vent and b-vent models have identical framing dimensions to simplify installation. Features standing pilot or the industry-exclusive Intellifire electronic ignition system. Other features include top/rear direct vent, more designer front choices, upgraded burner system, larger logs, more firebox options, and larger viewing area. Heater listed to ANSI Z21.88 standards.